More than a half-mile of raised boardwalk is now complete through Sterling Marsh west of Baldwin, Michigan. This is the culmination of a three-year project by the Spirit of the Woods Chapter of the NCTA. The man who has spearheaded the effort is Ed Chappel of Irons, the Trail Work Coordinator for the chapter. Ed is 77 years young, and battling Parkinson's Disease, but this has only served to focus his efforts even more. Volunteers from the Spirit of the Woods, Home Depot, the Baldwin Rotary Club, the American Hiking Society, an NCTA Volunteer Adventure crew, Manistee National Forest staff, and other people have put in thousands of hours to complete the 2,697 feet of boardwalk. The length is not continuous, but consists of thirteen segments spread over 1.5 miles of trail. With just a little additional work on treadway between the segments, and an improved access south from Jenkns road, the entire section will be wheelchair accessible. On July 23, 2011, at a chapter meeting, another two-year project was brought to fulfillment. 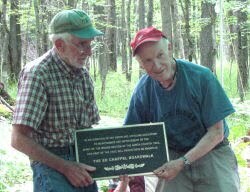 John Cooley, chapter member began planning on the sly to dedicate the boardwalk to Ed Chappel. He researched prices for plaques, obtained permission for the project from the Forest Service, and collected donations from chapter members and friends. No chapter funds were used to purchase the plaque. 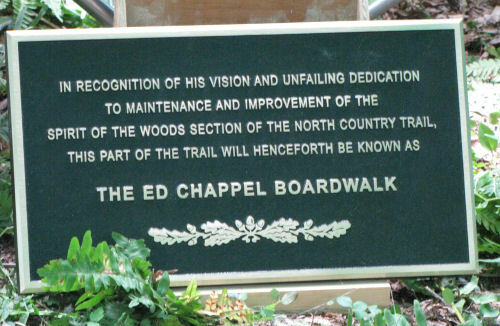 The plaque reads, "In recognition of his vision and unfailing dedication to maintenance and improvement of the Spirit of the Woods section of the North Country Trail, this portion of the trail will henceforth be known as the Ed Chappel Boardwalk." The miles of trail between Jenks Road and 96th Street, at the southern edge of Lake County, have been some of the most unpleasant off-road hiking in Michigan for years. The ground has always been soggy, and in spring and fall, the trail was often knee-deep in water. Hikers typically avoided the section, although it offers some high quality bird and wildlife watching opportunities. Now, the worst part of hiking there might be the need for a little extra bug repellent. Section maintainers, John Cooley and Vickie Kelley are also volunteers with the annual frog census, and they canvas Sterling Marsh for identification of the amphibians. Now they can do so without waders. The Forest Service hopes to create a new access point at Jenks Road so that the boardwalk would be able to be reached by level trail by wheelchairs. Near the center of the longest section is a deck with seating where the dedication plaque is mounted.